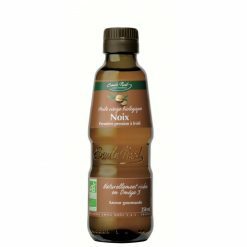 Made from shelled walnuts, this oil has a balanced fruity, yet bitter, taste. Organic farming methods guarantee respect for the environment and farmers, and optimum taste and quality. It is particularly recommended for all Mediterranean-type dressings. This well-balanced oil naturally contains Omega 6 and Omega 3, with a Omega 6 to 3 ratio of 5, as recommended by nutritionists, as well as Omega 9.